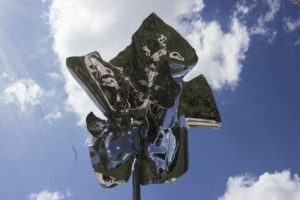 This stainless steel sculpture is based on two symbols that represent Alberta – the wild rose and the lodgepole pine. Eighteen feet in height, Wild Rose appears to be an over-sized flower. Up close, the detail of the original materials used to make the sculpture reveal themselves. The stem is a weathered lodgepole pine tree stripped of its branches and bark. On its upper reaches, a piece of cloth, pierced by the pole, billows with the wind, taking on the appearance of an abstract flower. The artists intended Wild Rose to stand as a contemporary and symbolic marker of belonging, in a landscape imbued with Indigenous history, and rich with a diversity of natural resources.